Numero Uno—“New Responsibilities for GovernmentOne lesson is clear from the reports of the several committees attached as appendices. The Federal Government should accept new responsibilities for promoting the creation of new scientific knowledge and the development of scientific talent in our youth. In discharging these responsibilities Federal funds should be made available. We have given much thought to the question of how plans for the use of Federal funds may be arranged so that such funds will not drive out of the picture funds from local governments, foundations, and private donors. We believe that our proposals will minimize that effect, but we do not think that it can be completely avoided. We submit, however, that the nation’s need for more and better scientific research is such that the risk must be accepted. Basic research is a long-term process – it ceases to be basic if immediate results are expected on short-term support. Methods should therefore be found which will permit the agency to make commitments of funds from current appropriations for programs of five years duration or longer. Continuity and stability of the program and its support may be expected (a) from the growing realization by the Congress of the benefits to the public from scientific research, and (b) from the conviction which will grow among those who conduct research under the auspices of the agency that good quality work will be followed by continuing support. I believe that, as a permanent measure, it would be appropriate to add to the agency needed to perform the other functions recommended in this report the responsibilities for civilian-initiated and civilian-controlled military research. The function of such a civilian group would be primarily to conduct long-range scientific research on military problems – leaving to the Services research on the improvement of existing weapons. Some research on military problems should be conducted, in time of peace as well as in war, by civilians independently of the military establishment. It is the primary responsibility of the Army and Navy to train the men, make available the weapons, and employ the strategy that will bring victory in combat. The Armed Services cannot be expected to be experts in all of the complicated fields which make it possible for a great nation to fight successfully in total war. There are certain kinds of research – such as research on the improvement of existing weapons – which can best be done within the military establishment. However, the job of long-range research involving application of the newest scientific discoveries to military needs should be the responsibility of those civilian scientists in the universities and in industry who are best trained to discharge it thoroughly and successfully. It is essential that both kinds of research go forward and that there be the closest liaison between the two groups. I. Purposes. – The National Research Foundation should develop and promote a national policy for scientific research and scientific education, should support basic research in nonprofit organizations, should develop scientific talent in American youth by means of scholarships and fellowships, and should by contract and otherwise support long-range research on military matters. II. Members. – 1. 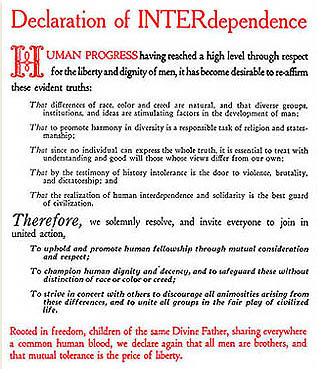 Responsibility to the people, through the President and Congress, should be placed in the hands of, say nine Members, who should be persons not otherwise connected with the Government and not representative of any special interest, who should be known as National Research Foundation Members, selected by the President on the basis of their interest in and capacity to promote the purposes of the Foundation. a. Division of Medical Research. – The function of this Division should be to support medical research. b. Division of Natural Sciences. – The function of this Division should be to support research in the physical and natural sciences. c. Division of National Defense. – It should be the function of this Division to support long-range scientific research on military matters. d. Division of Scientific Personnel and Education. – It should be the function of this Division to support and to supervise the grant of scholarships and fellowships in science. e. Division of Publications and Scientific Collaboration. – This Division should be charged with encouraging the publication of scientific knowledge and promoting international exchange of scientific information. f. To review and balance the financial requirements of the several Divisions and to propose to the President the annual estimate for the funds required by each Division. Appropriations should be earmarked for the purposes of specific Divisions, but the Foundation should be left discretion with respect to the expenditure of each Division’s funds. V. Patent Policy. – The success of the National Research Foundation in promoting scientific research in this country will depend to a very large degree upon the cooperation of organizations outside the Government. In making contracts with or grants to such organizations the Foundation should protect the public interest adequately and at the same time leave the cooperating organization with adequate freedom and incentive to conduct scientific research. The public interest will normally be adequately protected if the Government receives a royalty-free license for governmental purposes under any patents resulting from work financed by the Foundation. There should be no obligation on the research institution to patent discoveries made as a result of support from the Foundation. There should certainly not be any absolute requirement that all rights in such discoveries be assigned to the Government, but it should be left to the discretion of the director and the interested Division whether in special cases the public interest requires such an assignment. Legislation on this point should leave to the Members of the Foundation discretion as to its patent policy in order that patent arrangements may be adjusted as circumstances and the public interest require. VI. Special Authority. – In order to insure that men of great competence and experience may be designated as Members of the Foundation and as members of the several professional Divisions, the legislation creating the Foundation should contain specific authorization so that the Members of the Foundation and the Members of the Divisions may also engage in private and gainful employment, notwithstanding the provisions of any other laws: provided, however, that no compensation for such employment is received in any form from any profit-making institution which receives funds under contract, or otherwise, from the Division or Divisions of the Foundation with which the individual is concerned. In normal times, in view of the restrictive statutory prohibitions against dual interests on the part of Government officials, it would be virtually impossible to persuade persons having private employment of any kind to serve the Government in an official capacity. In order, however, to secure the part-time services of the most competent men as Members of the Foundation and the Divisions, these stringent prohibitions should be relaxed to the extent indicated. A machine defines (by its very structure) a language, viz. its input language: conversely, the semantic definition of a language specifies a machine that understands it. In other words: machine and language are two faces of one and the same coin. I am going to describe such a coin. I leave it entirely to you to decide which of these two aspects of the subject matter of my talk you think the most important as it is rather ridiculous in both aspects. The language I am going to sketch is prohibitively difficult for a human user and the machine I am going to describe is of a perverse inefficiency. Therefore, if my mental construction, nevertheless, has a right to exist it should derive this from other qualities. My machine derives this, to my taste and judgement at least, from its extreme simplicity and elegance, from the uniform way in which it performs its (at first glance) rather different operations; the justification for my language are its clearness and the unusually high degree of ambiguity, derived from a strict sequential interpretation and an explicit indication in the program to perform operations, which are usually implicitly understood (and therefore apt to misunderstanding). If one wishes to do so one may regard my machine and my language as being conceived for the purpose of clarification. Before I really start with my description I should like to warn you for two intentional omissions. The system I am going to present is the result of a careful choice between a great number of “neighbouring possibilities”. I shall not give my motivations for these choices, I shall even leave the consciously rejected alternatives unmentioned. In other words, I refrain from introducing my system at least in some respects as, say, a “local optimum”. As this diminishes the convincing power of my presentation, I personally regret this omission. I have to omit these motivations, however, for the sake of brevity. The other question I shall not touch is the question how to implement this system with the aid of a conventional machine. One might even raise the question —as I did myself to check that I was not thinking nonsense— whether it can be implemented at all, no matter how crudely. You have to take my word for it that it can be done. I have worked out a method of implementation to a degree that could convince, I think, the most suspicious auditor of the possibility. But it is my intention not to show you the particulars of this implementation, because I had to incorporate too many arbitrary decisions in which, when mentioned, would only divert the attention from the essentials. In particular, the question of storage allocation will remain untouched. My Machine operates on (and under control of) units of information which I call “words”. Without loss of generality I can restrict myself to a finite number of different words, each represented by the same number of bits. The machine distinguishes between different kinds of words, say numbers, operators, variables and separators. For the time being we shall confine our attention to the first of these, “number words” and “operator words”. A normal arithmetical operation, say the addition or multiplication of two numbers, has two number words as input and one word, also representing a number, as output. The rules according to which a numerical value should be attached to (i.e. derived from the bits of) a number word are embodied in the workings of the arithmetic unit, which has the usual property that these same rules apply to both input and output: the output of the arithmetic unit can be fed into it again at some later stage of the process. As we assume that the properties of the arithmetic unit are constant in time, we may say that the number words have “a fixed meaning”. As the fixed interpretation of number words is coupled to the constant properties of the arithmetic unit it is not so surprising that we shall denote the basic arithmetic operations by operator words (“+”, “-“, “*”, “/”, etc.) the meaning of which can also be regarded as fixed. The machine works under control of a program which primarily consists of a string of words. For the time being I shall confine myself to pieces of program prescribing the evaluation of arithmetic expressions. 5 39 7 2 3 * + / + 6 – . The well known mechanism especially devised for the sequence evaluation of such an expression is what I prefer to call a “stack”. (This device has been invented and generalized independently by so many people that it is known now under a great variety of names, such as “push down list”, “nesting store”, “cellar”, “last-in-first-out-memory” etc.) If we regard the above sequence of numbers and operators as the string of words representing a piece of program, the machine reads this string word by word from left to right. If it reads a number word, this number (i.e. a copy of this number word) is added to the top of the stack, if it reads an operator word, the operation in question is performed at the top of the stack. In illustration I give on successive lines the successive pictures of the top of the stack is at the right hand side of the line. and the net result of the execution of this little piece of program is that the value of the expression has been added to the stack. As clearly shown in the above example the machine starts by copying the program text word by word into the top of the stack. Sooner or later this has to be interrupted, otherwise our machine would just be a copying machine. In the above system the process of copying is interrupted by the occurrence of an arbitrary operator in the program text. The function of an operator, therefore, is a double one: firstly it indicates that the copying has to be interrupted for a while, because now an operation has to be performed, secondly it specifies this operation. I propose to separate these two completely different functions: from now on arithmetic operators are primarily treated in exactly the same way as numbers are treated, i.e. the operator word is copied into the stack as well. Every time the process of copying has to be interrupted I shall indicate this in the program explicitly by the insertion of a special word, introduced now and represented by “E” (from “Evaluate”). My machine now takes the following form. It reads the program text word by word, from left to right. By “reading” is meant the following: if the word read is unequal to “E” a copy of it is added to the stack, if the word read is equal to “E”, it is not copied but, instead, the operation takes place as specified (primarily) by the top word of the stack. In other words: if an operand of an arithmetic operation happens to be an expression we substitute for this expression its numerical value before the operation is called into action, thus appealing to the fact that, primarily, the arithmetic operations are defined only when supplied with numerical operands. We regard the replacement of a (sub)expression by its numerical value as a “substitution”, and we indicate explicitly when these substitutions have to be performed, although, linguistically speaking, this rather abundant: “3 + 4” will always be equal to “7”, no matter when we perform this addition. at a moment that the value of the variable x equals 3. This means that in the above expression we must substitute for “x” its numerical value at that moment; only after having done so we can perform the arithmetic substitution (” 3+4 ” being replaced by ” 7 “). Given something dependent on x (viz. the expression ” x+4 “) we create a result (viz. ” 7 “) which, thanks to the fact that we have substituted for x its present value, is made independent of the future history of x. We have fixed an “instantaneous picture” of the variable x. Obviously I insist upon indicating explicitly when this instantaneous picture of the variable x (which is varying in time!) has to be taken. All words read in the text are added to the stack except the word “E” which causes the machine to perform a substitution. For reason to be explained below we should like to have also the possibility of adding the word “E” to the stack. The framework for this extension, however, is already present. We introduce a special operator, denoted by the word “P” (from “Postponement”), which effects upon evaluation a fixed substitution, vis. its replacement by the word “E”. We shall illustrate the use of the operator “P” in the next example. and the top of the stack thus contains the string of words which, when read as a piece of program, would effectuate the evaluation of the expression ” x + y “. If the value of the variable “plinus” would have been “–” we would have generated (the string of words corresponding to) the expression ” x – y “. What we have done amounts to a partial evaluation of the expression ” x plinus y “, the result again being an expression. In our previous examples the final addition to the stack always consisted of a single number. But a number is a trivial example of an expression and generating not only numbers but also more general expressions as intermediate results is therefore an obvious extension of normal practice. Up till now we have described the generation of words on top of the stack but not what we are going to do with these words. Furthermore we have assumed that with respect to given variable the process could be in such a state that evaluation of this variable would give rise to a previously defined substitution, but how this definition should take place is not mentioned in the above. These two gaps in our picture will both be filled by the introduction of the assignment operators. Upon evaluation of the assignment operator “:=” the machine investigates the immediately underlying word. This must be the variable to which an assignment has to take place; the next underlying word is assigned to this variable (a process, about which more below) and the three words on top of the stack (which have now been processed) are removed from the stack. Until further notice —i.e. a new assignment to the variable “x“— the evaluation of this variable will result in the replacement of the top word of the stack by the word “3”. But for the interchanging of left and right hand side this is closely analogous to the assignment statement as known in ALGOL 60. But we need more than that for, in general, the assigned value will not consist out of a single word, but out of a string of words and we must therefore have a means of indicating how deep in the stack the assigned value extends. The simplest way to do this is to insert in the stack a marker, say the special word “T” (from “Terminal”) at the bottom side of the assigned value. Furthermore we introduce another assignment operator “:-” (called the “string assignment” in contrast to the “word assignment” introduced in the previous paragraph). Upon evaluation of this operator the machine investigates the top of the stack in downward direction. The first word (immediately under the operator “:-“) must be the variable to which a value has to be assigned. Thereafter the machine continues its word by word investigation in the downward direction until it meets the special marker “T”: the words passed in this way form together the string that acts as the assigned value. The simplest way to add a “T” to the stack would be just to insert the word “T” in the proper place in the program under control of which the stack is being filled. This arrangement, however, will not do; for reasons to be explained later we need the possibility of generating a “T” on top of the stack under control of a program that itself does not contain this word. We can do this with the same trick that enabled us to generate an “E” on top of the stack. We introduce a new operator, denoted by the word “S” (say from “Separator” or because it precedes the “T” in the alphabet) which upon evaluation is replaced by the word “T” and we make it a rule that this will be the only way in which words “T” are added to the stack. Using all this we have an alternative to write the assignment statement ” x := 3 “, viz. The net effect of this is equivalent to the previous form using the word assignment “:=”. ” S E x P E y P E plinus E P E z :- E ” . ” z → x E y E + E T ” . ” x → 3 T ” . One of the most illuminating aspects of this arrangement is that the usual distinction between “numbers” and “instructions” has completely vanished. The value of a variable is defined as a piece of program, evaluation of this variable implies the execution of this piece of program. Furthermore we should like to draw attention to a certain form of duality between the assignment on the one hand and reading a text on the other. When the machine reads a piece of program text, the top of the stack is filled under control of this program text. In the assignment “readable text” is created under control of the contents of the stack. The duality can also be illustrated by taking into consideration the accessibility requirements. The words in the stack need only be accessible in the direction from top to bottom. If an assignment statement converts the top of the stack into readable text, however, the consecutive words thereby become accessible in the other direction. Finally, the stack is reserved for “anonymous intermediate results”, whereas readable text —in principle, at least— is always “named”, for we create it by assigning it to a variable. The attentive reader will have noticed that, along with the representation of the value of a variable, we have silently introduced two more complications in our machine. The first one, the occurrence of the word “T” in program text and the machine’s “immediate reaction” to it is a relatively simple one. As we have described the organization, the word “T”, when read in the text, is not copied on top of the stack! Instead, it causes the machine to go on reading at the first word following in the string after the “E” that caused this evaluation of the variable in question. In other words, it acts as a “Return” at the end of a closed subroutine. Note. We could try to merge our two stacks into one. This merging would present itself in a completely natural fashion if the two should expand and shrink “in phase” with one another. In general, however, this is not the case and trying to merge the two stacks into a single one would give a highly unnatural construction. First of all we meet the fact that one and the same identifier may play different roles thanks to the fact that it occurs in more than one declaration. A lexicographical rule then tells us which one of these declarations applies everywhere, where the identifier in question may be used. This form of multiple use of one and the same identifier could be removed by a simple process of renaming. But there is a much more subtle case of “multiple use of one and the same identifier”, viz. as soon as a certain block occurs in one or more nested activations (as in the case of a a recursive procedure). In other words: one and the same identifier then refers sometimes to this variable, sometimes to another. In actual fact: the identifier stands for a variable and in order to indicate clearly for which variable it stands I intend to denote explicitly the moment when a variable has to be substituted for an identifier. For the sake of convenience —to be more exact: convenience for the machine and not for the hypothetical user— I intend to use the same identifiers for the local variables of every activation. (What I call “an activation” is closely analogous to a block or procedure body, as known in ALGOL 60.) I use for this purpose the special identifier words “L0”, “L1″,”L2”, etc.. If the machine starts the evaluation of a variable, the stack of activations increases with one item. At the start this item also contains a note that up till now no local variables have been introduced in this activation. If the machine reads the word “E” at a moment that the top of the anonymous stack contains one of the identifier words (say “L2”) then it investigates the top item of the stack of activations. If it is the first time that this identifier has to be evaluated in the present activation the machine creates a new variable for it (and may give this variable an empty value) and makes in the youngest item of the stack of activations a note to this effect. Then it replaces the top word of the anonymous stack by the variable just created for it. At a next evaluation of the same identifier at a moment that the same activation is still (or again) the present one, the machine finds in the top item of the stack of activations the note left there at the first evaluation of this identifier and the top word of the stack is replaced by the same variable. and what we have done can be interpreted as the addition of two complex numbers. In ALGOL terminology: “complus” is a procedure with four numerical parameters, all called by value. The simple structure of the process allows the first of these to remain anonymous even in the procedure body. Furthermore, it is a kind of “type procedure”, be it one that, syntactically speaking, takes the place of two primaries. are completely equivalent. This example is included to show as clearly as possible the arbitrariness of our primitives. Conclusion.I am fully aware that the sketch is definitely incomplete. Particularly conditional reaction and some equivalent of the go tostatement should be incorporated if one wishes to make a system out of this. For the moment I leave these out and I do so for two reasons. Firstly for the sake of brevity and secondly because I have not decided yet: for I know of several possible ways but none of them fully satisfies me. With some versions of these facilities I have made slightly more elaborate programs. They showed me both the power and the weakness of my Language, its power being its flexibility and its unambiguity, its weakness being the fact that using it intelligently proved to be far above at least my powers. If nevertheless I claim attention for this project I don’t do so only because it charms me and may charm others as well. This report is the condensation of my meditations after we had completed our implementation of ALGOL 60. This implementation was conceived at high speed and the main justification for the numerous decisions taken in those hectic months was the recognition that our conceived constructions would lead to our goal and would do the job, in some way or another. The Machine described in this report, however, represents an extreme of the continuous spectrum of possible implementations of an algorithmic language which (as is the case with ALGOL 60) caters for recursiveness. In this quality it has been very clarifying for me personally: it has helped me a great deal in the appreciation of the various (initially disconnected) tricks we have incorporated intuitively and it has clearly shown us a number of alternative solutions. Therefore the hope is justified that translator construction and machine design in the future will benefit from these considerations. Furthermore, the Machine presented here is so ridiculously inefficient that every practical implementation of a practical algorithmic language in all probability can be regarded as an optimization of it, an optimization which is permissible thanks to certain restrictions in the language. It may be useful to compare a proposed language with my language; during the process of language construction it may be helpful in the timely detection of ‘expensive features.’ Whether such an expensive feature will be included or not is more or less a political question but quite apart from how such a question is answered it is nice to know what one is doing. Numero Tres—“At a time in America when being a housewife and mother was the primary occupation approved for women, Ariel Durant showed one way of breaking the mold. Involved in a lifelong loving relationship with her husband, Will, and mother to daughter, Ethel, Ariel Durant first became an assistant and then an equal to her prolific philosopher-writer husband. An active lecturer and believer in the rights of women, Ariel Durant was able to share in her husband’s fame and accomplishments, though with her personality and ambition she probably would have preferred more independent recognition for her talents. Ariel Durant was born as Chaya Kaufmann in Proskurov, Russia, on May 10, 1898. She was the daughter of Ethel Appel Kaufman and Joseph Kaufman, a clothing store salesman who emigrated to America, bringing his family over in search of a better life in 1901. Her early family life was unsettling: her parents made a meager living selling newspapers, and her mother became active in the anarchist movement, eventually moving away from the family. When Chaya was 14 she transferred from the New York City public schools, where she had gone sporadically, to the anarchist-inspired progressive Ferrer Modern School. Her teacher was Will Durant. Husband and wife had opposite personalities: he was shy and retiring, she was outgoing and social. He offered her an outlet for her intellectual curiosity and she introduced him to the world of artists, poets, philosophers and entertainers with whom they socialized in New York and Los Angeles. Ariel became a brilliant conversationalist and sharp debater under the tutelage of the man she called her “teacher, lover, mentor and friend.” Will especially appreciated Ariel’s compulsion to speak her mind, her fun loving appreciation of life, and her championing of women’s rights.As early as 1912, Will Durant envisioned writing a five-part history of civilization, told through the stories of famous people of the times. This was a very different approach from historical research of the time: it made history very readable to the general public, and the volumes were well received by a nation recovering from world war, though some strict historical academicians were harsh critics. The Story of Civilization tries to show the interrelations between science, politics, economics, art, religion and literature of the past 6,000 years. It became an 11-volume opus published between 1935 and 1975. Ariel began helping Will with this massive project by classifying and organizing his copious notes. As his literary assistant, she worked by his side in relative anonymity for many years. She began supplementing and complementing his research and soon was a critic and contributor. Ariel began to conduct much of the research herself for volume 4, as Will was now in his seventies. In 1961, when the seventh volume was published, Ariel Durant received joint author credit for that and the remaining four volumes. Her own interests in women, France, and England had an impact on the focus and content of the multivolume series. The Durants were awarded the Pulitzer Prize for Literature in 1968 for Rousseau and Revolution, the tenth volume of the series. After World War II, both Durants became involved in a movement to lessen the racial and religious tensions in the United States. Although Will was the key figure behind the “Declaration of Interdependence,” Ariel took an active role. The movement is still active today. 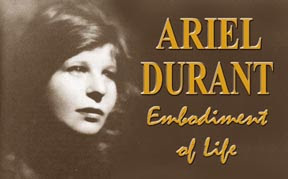 The Durants were elected to the Institute of Arts and Sciences, and Ariel was chosen one of the five women of the year in 1965 by the Los Angeles Times. In 1977 the Durants published A Dual Autobiography. They both received the Presidential Medal of Freedom from President Ford that same year. Ariel Durant died at home on October 25, 1981. Her husband, then 95 years old and recovering from surgery in the hospital, died less than two weeks later.